Jennings Environmental Education Center was chosen by the Pennsylvania Department of Conservation and Natural Resources (DCNR) and its Bureau of Parks as one of “25 Must-See Pennsylvania State Parks”. 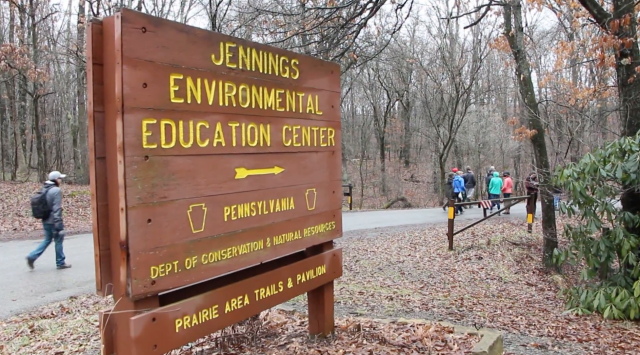 The main purpose of Jennings Environmental Education Center is to provide environmental education for the citizens of Pennsylvania and specifically the students of the nearby elementary schools, high schools, colleges, and universities. Jennings stays busy offering hands on opportunities to these students and their teachers with a “discovery and problem solving” approach. Jennings offers numerous programs to the public throughout the year, many of which are free. Some, such as the National Public Lands Day volunteer project, require pre-registration. The annual Celebrate the Bloom festival, which occurs when the blazing star is in peak bloom, began in 2013. Jennings annually hosts Pennsylvania District 9’s Enviroquwst competition that challenges students to work in groups and prove their ecology knowledge. LeAnn Williams, a teacher at New Castle High School hosts the event. Williams is known to encourage students to join the program and go outdoors to study. As of 2015, the program has also been joined by Jennings’ own Francis Shon, the Master of Ceremonies for the park. Prairies are extremely rare in Pennsylvania. They are usually found further to the west in Ohio, Indiana and across the midwest to the Rocky Mountains. The prairie at Jennings Environmental Education Center is the only protected prairie ecosystem in Pennsylvania. It provides a habitat for plants that are unique to prairie and the endangered massasauga rattlesnake. Jennings Environmental Education Center was the first state park established to protect an endangered plant, the blazing star. This first humans arrived in the Jennings Environmental Education Area nearly 15,000 years ago. These paleo-Indians followed the receding glaciers at the end of the ice age in pursuit of wooly mammoths and giant ground sloths. It is believed that overhunting the mammoths and sloths lead to their eventual extinction. The Iroquois settled in the area and began to farm the land by the end of the 16th century. They used fire to open areas for farming. This may have helped to sustain the prairie environment that is currently at Jennings Environmental Education Center. European pioneers from the Thirteen Colonies and New France passed through the area and used the Venango Path an Indian trail, portions of which have since been paved over by Pennsylvania Route 528. The trail extended from Pittsburgh to Franklin. It was used by a historical figures such as Tecumseh, Marquis de LaFayette and George Washington. The area was not heavily settled until the 1800s. The first settlers cleared the land of its standing trees and began farming. The land was not ideal for farming and soon people looked for other uses of the land. They discovered coal and the mining of coal became a booming industry in Western Pennsylvania. Jennings Environmental Education Center is named for Dr. Otto Emery Jennings. He was a renowned botanist who searched throughout Pennsylvania for unique plant species. He discovered the Jennings Prairie in 1905 and was instrumental in the purchase and protection of the area by the Western Pennsylvania Conservancy (it became a “nature reserve” in 1952). Dr. Jennings ensured that the area would be protected for the enjoyment and future education of many generations of Pennsylvanians. Jennings Environmental Education Center was established in 1979. Directly across Route 8 from the park is the Old Stone House, owned and operated by Slippery Rock University. The house served as a tavern and inn from the colonial period until the mid-1800s and legend has it that George Washington stopped at the inn on his way to Fort LeBoeuf. The Old Stone House is open on weekends and tours and programs take place regularly throughout the year. The old Foltz School House is located on Jennings property and is in the process of being restored.